Shreyas Gopal enjoyed perhaps his best day in the office on Tuesday evening. 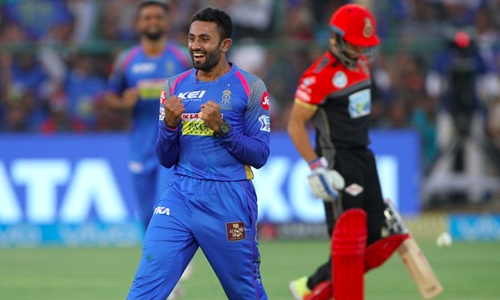 The Rajasthan Royals (RR) wrist spinner showed off his brilliant skills to nail a googly as he dispatched arguably the top three Royal Challengers Bangalore (RCB) batsmen in the Indian Premier League (IPL) contest held at Sawai Mansingh Stadium in Jaipur. First, Gopal unleashed a pitch-perfect wrong ’un to breach the defence of RCB captain Virat Kohli. No wonder, wild celebrations ensued in the RR camp. Then, he delivered another googly, this time to AB de Villiers, who edged it back to Gopal. This time the bowler though couldn’t believe his eyes. Later, it was left-handed Shimron Hetmyer, who was surprised by the away-going delivery that he edged straight to wicket-keeper Jos Buttler. Gopal went on to finish with stunning figures of 4-1-12-3 as RCB could only manage 158-4 in 20 overs. In reply, Buttler scored 59 before Steve Smith (38) and Rahul Tripathi (34 not out) ensured first points for RR in the standings. As for RCB, they find themselves in a spot following their fourth defeat in as many matches.